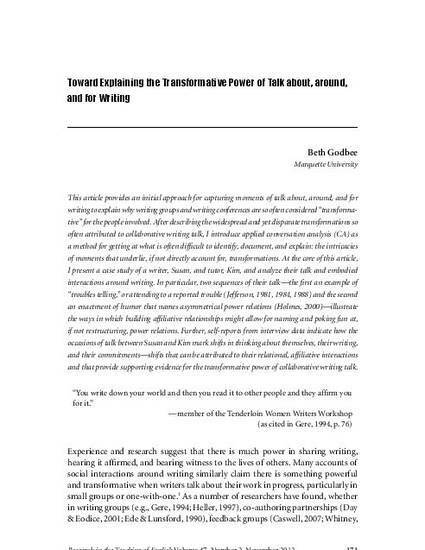 This article provides an initial approach for capturing moments of talk about, around, and for writing to explain why writing groups and writing conferences are so often considered “transformative” for the people involved. After describing the widespread and yet disparate transformations so often attributed to collaborative writing talk, I introduce applied conversation analysis (CA) as a method for getting at what is often difficult to identify, document, and explain: the intricacies of moments that underlie, if not directly account for, transformations. At the core of this article, I present a case study of a writer, Susan, and tutor, Kim, and analyze their talk and embodied interactions around writing. In particular, two sequences of their talk—the first an example of “troubles telling,” or attending to a reported trouble (Jefferson, 1981, 1984, 1988) and the second an enactment of humor that names asymmetrical power relations (Holmes, 2000)—illustrate the ways in which building affiliative relationships might allow for naming and poking fun at, if not restructuring, power relations. Further, self-reports from interview data indicate how the occasions of talk between Susan and Kim mark shifts in thinking about themselves, their writing, and their commitments—shifts that can be attributed to their relational, affiliative interactions and that provide supporting evidence for the transformative power of collaborative writing talk. Published version. Research in the Teaching of English, Vol. 47, No. 2 (2012): 171-197. Permalink. © 2012 National Council of Teachers of English. Used with permission.